Tobiko is one of the most prized sushi roe, valued as a finishing touch and garnish to rolls as well as enjoyed on its own by true lovers of the dish. Tobiko is the roe of tropical flying fish, which are known for their ability to leap into the air at speeds of over 40 mp/h. Tobiko adds a splash of color and its unmistakeable crunchy texture to many different rolls, including the popular California roll. If you eat sushi regularly, it is a good bet you have enjoyed Tobiko in your life. The bright-red natural hues of Tobiko are in contrast to its mild taste, which is slightly sweet and salty. It is most often added to rolls not simply for its taste, but because of its consistently crunchy texture and bright appearance. There is little more satisfying than the fun crunch of biting into Tobiko. 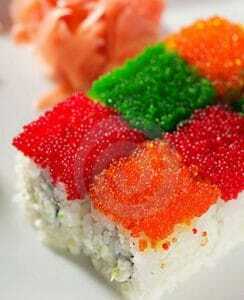 Those who love Tobiko most enjoy the dish as a nigiri item, piling the roe on top of vinegared sushi rice. While Tobiko is prized for its use in sushi, it is a versatile ingredient in other cuisine. Tobiko can be enjoyed on crackers, in omelets, or on salads for example. Nutritionally, Tobiko is loaded with protein, vitamins, and omega-3 fatty acids. In spite of this, Tobiko should be eaten in moderation because of its high cholesterol content. As Tobiko is often used as a garnish, the levels of cholesterol are not usually worrisome as part of a healthy diet. Masago is the roe of Capelin, an Atlantic and Artic fish. Perhaps the tropical sun is needed to give Tobiko roe its bright colors, as Masago is dull and usually dyed before it is eaten to give it a more pleasing appearance. While Masago shares a similar taste to Tobiko, it lacks the same distinctive crunch and is in general a more boring and less versatile ingredient than Tobiko in sushi cuisine. This has not stopped many sushi restaurants from substituting Masago for Tobiko because of one big difference between the two roe – Masago is noticeably cheaper than Tobiko. Tobiko is usually a higher quality product than Masago, but this has not stopped restaurants from substituting the two to help their bottom line. Tobiko is also slightly larger than Masago. If you want to enjoy Tobiko, it can be purchased on its own from sushi retailers to make sure you are getting the crunchy sweetness you are looking for.